Sandy Bartlett, Gurdy Leete, John Miller, and Curtis Regentin. Online EQUATIONS is the pinnacle of fifty years of research, testing and development of the best aspects of the Instructional Gaming Program. It presents an optimal blend of simplified rules, guided prompting and support for players, and automated tournament and curriculum management for teachers and parents. Online EQUATIONS can be used to run everything from pickup games between casual players to various kinds of tournaments occurring in class, at home, or between different classes or groups at the city, state, national and international levels. The program manages all aspects of the game with automated scoring, newsletter and award creation and extensive record keeping of every match played. 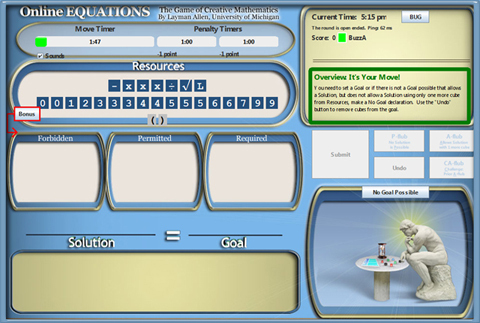 Online EQUATIONS also implements advanced curriculum topics using options for 3+ scoring methods and adventurous rules and allows easy monitoring of how players are applying new ideas. The program offers an invaluable platform for professional development courses for teachers and is a gold mine for researchers seeking to study the dynamics of how knowledge spreads through peer teaching and methods for optimizing motivation, achievement and acquisition of advanced concepts. Click Here to arrange a free, personal, online demonstration for you or your group.